Manama, Bahrain, 26 June 2018 (IUCN) – The Belize Barrier Reef Reserve System – the world’s second largest coral reef system after the Great Barrier Reef – has come off the List of World Heritage in Danger, following the advice of the International Union for Conservation of Nature (IUCN). The decision was taken today at UNESCO’s World Heritage Committee meeting taking place in Bahrain. For the past 10 years or so, the World Heritage site has been facing threats from potential oil activities and unsustainable tourism development. However, Belize recently announced a ban on oil drilling in its entire marine territories, and reinforced the legal protection of its mangroves – which reduce the risk of disasters associated with climate change, keep the waters pristine and support local fisheries – from harmful developments. These decisions have led to today’s removal of the site from the ‘danger list’. Made up of seven marine reserves, the Belize Barrier Reef Reserve System was inscribed on the World Heritage List in 1996 for its outstanding marine values. It is home to the Critically Endangered Hawksbill Turtle and the Vulnerable West Indian Manatee, and boasts various types of coral reefs, numerous sand cays and mangrove islands, and splendid seascapes such as the world-famous “Blue Hole”. The site’s pristine waters and abundant marine life provide social and economic benefits to local people, such as locally managed fisheries and nature-based tourist attractions. Tourism and fisheries employ about half of Belize’s population, and highly depend on the site’s healthy marine ecosystems. The site was added to the List of World Heritage in Danger in 2009 due to unsustainable hotel development, whose devastating impacts increased its vulnerability to erosion and severe storms. Entire mangrove forests were cleared then, and replaced with sand and coral rubble extracted from nearby waters, which destroyed corals and seabed ecosystems. The site’s long-term sustainability came under threat again in 2011, when it emerged that offshore oil concessions existed within the site. 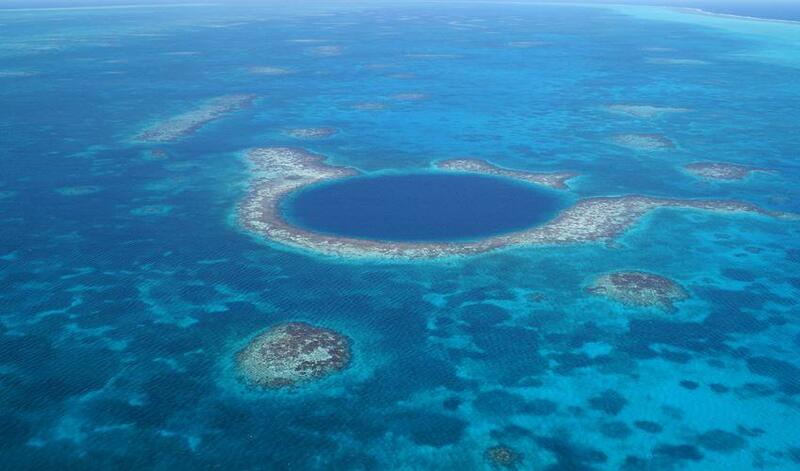 The World Heritage Committee, following the joint advice of IUCN and UNESCO’s World Heritage Centre, repeatedly called on Belize not to allow any oil activities that could potentially harm the site’s exceptional values. Due to their destructive and irreversible impacts, oil, gas and mining industries are seen as incompatible with World Heritage status. While unsustainable development no longer threatens the integrity of the Belize Barrier Reef Reserve System, the site is increasingly exposed to climate change, with impacts such as coral bleaching, rising sea levels, beach erosion and hurricanes. Climate change is the fastest growing threat to natural World Heritage, according to the independent 2017 IUCN World Heritage Outlook assessment.